Lord Puttnam highlights one of the key issues surrounding the release of films - from cinema to home entertainment. In today’s digital age, we consume films across a number of different platforms: DVD/Blu-Ray, Video on demand (Netflix, Amazon etc), as well as through different devices - our computers, on television, on tablets, even on our mobile phones. Many people want to see films as soon as possible, and in the digital age of vast choice, consumers can often feel frustrated if they are expected to wait! Whilst we don’t have to wait five years any more to watch a film after its cinema release, it may be frustrating sometimes not to be able to access films in any format at all for months after their cinema release. Why do you think that the mainstream cinema operators want ’exclusivity’ on new films for several months, even if they may only play them for a few weeks? Why do some ‘specialised’ distributors, for example Curzon, release some of their films online on the same day as they are released in cinemas? 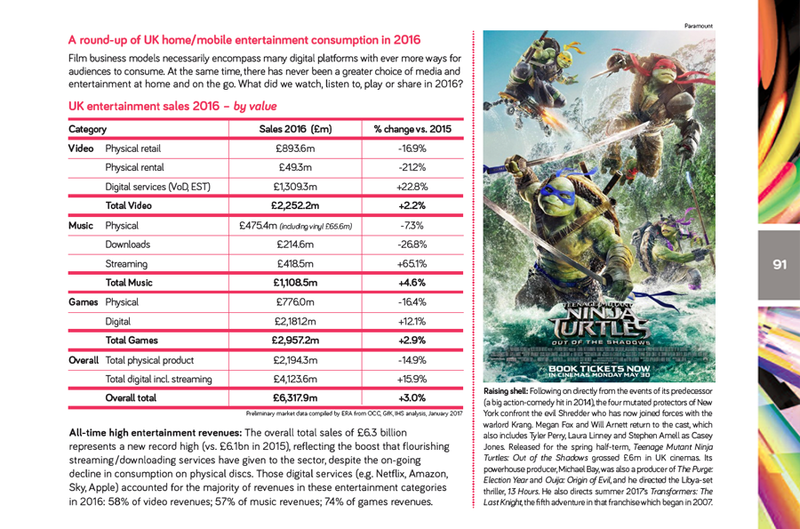 Look at the figures for the consumption of films via home entertainment platforms. What are the implications for the consumption of films after their cinema release when it comes to our watching them on other platforms ? How might this affect the revenue that the film distributor will get? In what ways do the top twenty films bought on DVD and Blu-Ray reflect the top 100 films seen in the cinema (or perhaps the top 20 or 30). Our desire to see films as soon as possible can sometimes lead people to watching pirated copies of films , in this day and age usually via illegal file-sharing online. Look at the figures for the top pirated films of 2016. Again, how do the titles in this list reflect the top 20 films released in cinemas in 2016? Do you think that people watch pirated versions instead of going to the cinema to see the films? Or are there other reasons? What might these be?